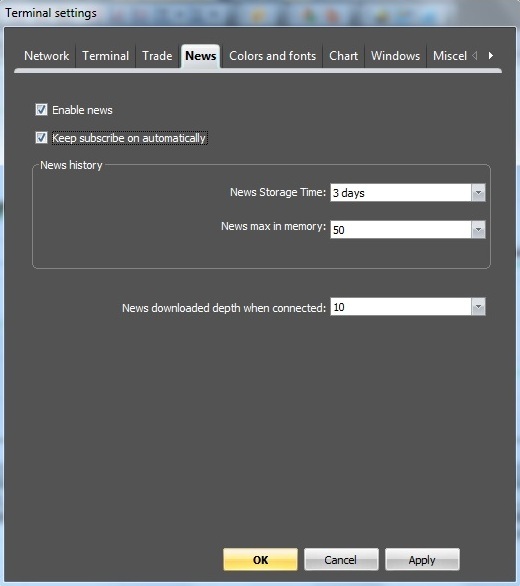 In the opened dialog box you can enable news, set automatic prolongation mode for subscription, news history properties (News Storage Time and News max in memory), as well as the amount of downloaded News when connected. Tick “Enable news” and “Keep subscribe on automatically” if necessary. The news feed is available if the account equity is more than $0.00. “News” information window is opened from the main menu - “View” – “News”. “News” window is continuously updated with fresh news and can consist of two sections. The upper section includes news headlines (with fields – Time, Headline, Providers and Languages). The lower section includes news content. Additionally, you can call a separate window with the news content by double-clicking on the line. News story – calling a separate window with the full text of the news. Show story view – enable/disable the mode of news content display in the lower section of “News” window. Select news languages (in the example two languages are selected – English and Russian). Columns and rows – the functions of displaying columns of “News” window.